This fall, I’m teaming up with the Center City Residents Association, the Clean Air Council, and Solar States, a local solar installer, to launch a Solarize Center City campaign in which residents in my neighborhood of west Center City can use their collective buying power to purchase solar systems for their properties at greatly reduced costs. Early this year, Solar States installed solar panels on my roof and I am very happy with the quality of their work and the tremendous savings I’ve seen. Importantly, displacing fossil fuel-produced energy with renewable energy curbs climate change and improves air quality, reducing asthma and other illnesses caused by pollution. Rooftop solar provides significant savings to homeowners, while contracting with locally-based Solar States creates green jobs and supports our local economy. When neighbors solarize together, Solar States can offer large discounts – the more neighbors the greater the discount. Solarize campaigns have the potential to reduce the cost of a home solar system by 15% compared to buying a solar installation individually. Combined with the federal tax credit of 30% (see www.seia.org/policy/finance-tax/solar-investment-tax-credit) that produces savings of 45%, and that’s just the beginning - savings from greatly reduced electric bills will continue over the years. After all, the sun is free! Solar States is an experienced solar installation company with its heart and roots in Philadelphia. As a B Corp, they are committed to the triple bottom line of people, planet, and profit. With over 250 solar installations throughout the region, including two past campaigns - Solarize Northwest Philly and Solarize Greater Media - they’ve proven a positive environmental impact. Through their partnership with Clean Air Council, Solar States educates students through the YouthBuild Philly Charter School and PowerCorps PHL fellowship program, helping them to enter the green collar economy, a field with sustaining wages and career opportunities. These classes have impacted hundreds of Philadelphians and allowed Solar States to employ a talented workforce representative of our diverse city. My rooftop solar went active in March, 2016, and I have been thrilled to see monthly electric bills as low as $7, even though I have an all-electric house (no natural gas). Of course, this will not be the case in winter, but nevertheless, it is remarkable to see my electric bill under $20 for months in a row, with no gas bill. By using an app on my phone, I am able to monitor my energy generation and consumption in several different graphs in order to coordinate my consumption with the sun, which I will be demonstrating during the Center City House Tour on Sunday, October 23, 1-5pm. More than anything, it feels great to know that I am doing my part to reduce carbons. This collaborative campaign gives center city residents a simple and cost effective way to address climate change, the most serious and urgent challenge of our times. Our grandchildren will thank us. For more information go to www.SolarizeCenterCity.com. The Clean Air Council and Sustainable 19103 are teaming up to encourage rapid deployment of rooftop solar in the Fitler Square neighborhood of center city Philadelphia. The groups are proposing to launch a Solarize campaign in the fall of 2016 in which residents can use their collective buying power to purchase solar systems for their properties at greatly reduced costs. We are looking for input and feedback from residents about the proposed solar campaign. 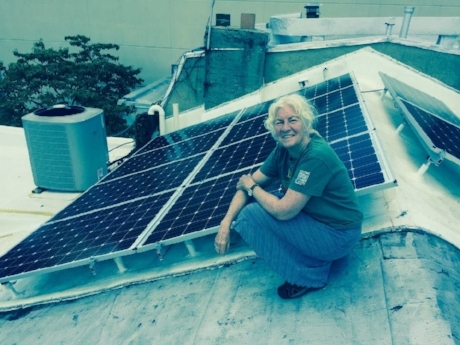 The first opportunity to hear more and see a typical solar insulation will be Thursday, May 19, 5:30-7:30 at the Fitler Square home of Judy Wicks (More Info). Displacing fossil fuel-produced energy with renewable energy helps curb climate change and improves air quality, reducing asthma and other illnesses caused by pollution and lowing healthcare costs. Rooftop solar provides significant savings to homeowners over many years and hiring a local solar installer creates green jobs and supports our local economy. When neighbors decide to go solar together, locally based solar installers can offer large discounts. An average sized home solar system can save the resident $25,000 over 25 years and has a life expectancy of up to 30 years. Solarize participants can get rooftop solar for monthly loan payments that are less than average electric bills. After loans are paid off, residents who go solar benefit from free electricity from the sun with greatly reduced electric bills, or even no generation charges at all, depending how the system is sized. Solarize campaigns have the potential to reduce the cost of the home solar system by 30% compared to buying a solar installation individually. In addition to the cost saving and environmental benefits, this campaign would also promote a diversified solar workforce in Philadelphia. Vocational students from YouthBuild Charter School in North Philadelphia will have the opportunity to gain hands on experience assisting with the campaign. Clean Air Council’s first solar initiative was a local campaign called Solarize Northwest Philly. In early 2015, homeowners attended workshops to learn about solar and 15 homeowners joined together to go solar! The total impact was about 75 kilowatts of new solar, which is the equivalent of planting over 25,000 trees or taking over 200 cars off the road. We now have an opportunity to replicate and expand on this success in Fitler Square by pursuing a Solarize campaign this fall. If you are interested in learning more about Solarize Fitler Square, please come to the Open House on May 19 to learn more details about the program. (More Info) Clean Air Council will be on hand at the event to discuss the proposed Solarize campaign. You can also contact your local solar ambassador, Judy Wicks, at info@judywicks.com. "I installed a solar array on my roof last fall and have been thrilled to see how much electricity it generates. Even though I have an all-electric house (no natural gas), on some days my rooftop solar produces as much as 90% of the power for my entire house. Of course, this is not the case in winter when I am using electric heat, but nevertheless, it is remarkable to see my electric bill under $20 for some months, with no gas bill. By using a software called Neurio, I am able to monitor my energy generation and consumption in several different graphs, which I will be demonstrating at the Open House on May 19. (More Info). More then anything, it feels great to know that I am doing my part to address climate change and the health issues caused by pollution." "Throughout my journey at Youthbuild Charter, the Solar-States and Clean Air Council solar training program has had a big impact on me and the Green Building construction track that I take at Youthbuild (Building Sustainable Houses using sustainable materials). I’m learning how to install a solar pv system and do basic electrical wiring and Solar-States also gave me an apprenticeship and a paid internship." Join us in "Conversations Toward A Sustainable Philadelphia", a series of talks hosted by Judy Wicks and the Sustainable Business Network, in collaboration with a growing number of networking partners. These events are intended to move our city toward a sustainable future by inspiring thought, discussion, and local action addressing climate change and environmental justice. We all want to be part of the solution by reducing carbons, but where do we begin?